eBay vs Amazon PRICE WAR - 50 Products Tested! HOW I Made £320,000 in 18 months on Amazon UK! 100% FREE VIDEO!!! Subscribe to my Newsletter and get INSTANT ACCESS NOW! eBay vs Amazon Price War – 50 Products Tested! 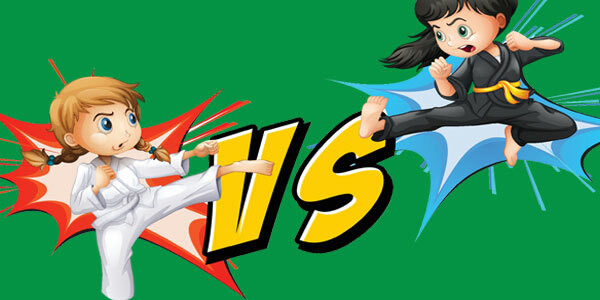 In the past I’ve done several “battle” blog posts, where I put a few options against each other in a side by side test in order to find the winner – such as the fulfilment house battle, which is a very popular post on this blog. “You can get higher prices for your products on Amazon than you can on eBay”. You see this “fact” quoted so often online, and I myself have actually said this a few times as, based on some random research I’ve done, it does appear to be the case more often than not. But I decided that it’s time to test this claim properly, and get some proof one way or the other. So today I’m pitting the two giants, eBay and Amazon, against each other in a comprehensive pricing test. Even though I would ideally test thousands of products to get the most accurate data possible, that’s just not feasible, so instead I’m going to choose 50. I don’t want there to be any confusion here – I’m doing this test so we can find out where it’s better to sell our products, not to find out whether you should use eBay or Amazon for this year’s Christmas shopping. And that means I will be completely ignoring products from major companies like Apple, Samsung, Nike etc. etc. I’ve probably said this a hundred times by now, but much to the dismay of those who are first looking into selling online – you cannot make any money on high end branded electronics/clothing as the margins are just too thin. Basically – the type of products that you can actually source and import from China. While I will of course try to get a good mix of different product prices, for similar reasons as the no big name brands rule, I will generally focus on products that sell for less than £50 as that’s really the optimum pricing level for small/medium sellers. This should be obvious, but I wanted to clarify it anyway – the final price that I’ll use for our test will include shipping. Most products will have free shipping, but if it is charged separately then I’ll add it to the product price to give us a final figure. There’s no point in comparing pricing if we’re going to include China or Hone Kong based sellers, so they’ll be ignored for the purposes of this test. As this test is all about finding the lowest price on Amazon or eBay, I won’t be relying solely on their best match algorithms but will instead sort my searches so that I’m given the lowest price options first. However there is an extra condition to this rule, in order to keep things as fair as possible I’ll be looking at the sales history for that product to ensure that it’s a REAL price and not just someone selling a product at a loss/well below market price in order to climb the search results (as described in my guide which you can read here). Of course on Amazon we can’t see a detailed sales history, like we can on eBay, but I will still try to eliminate temporary prices by looking at the reviews to ensure it’s an established listing. This rule is actually very important as the whole point of this test is to see what the actual long-term selling price is, so it would skew the results to take into account a listing with 5 for sale at a low price, when that won’t be there next week. Of course in a perfect test the products I compare will always be 100% exactly the same. However, practically speaking, this isn’t that easy to achieve. There may sometimes be slight variance in the products, such as colour, packaging, branding etc. but I will use my vast experience in sourcing products from China to make sure that it’s nothing that will greatly affect the selling or sourcing price. I have already done an in-depth comparison of the differing selling fees on eBay and Amazon and the outcome was that they’re generally fairly similar. While there was some variation depending on the product and category, today’s test is all about the SELLING PRICE (i.e. what customers pay for a product) so I’ll be completely ignoring the seller fees. Okay, now that you know the general guidelines/rules I’ve followed, let’s get to the bit you’ve been waiting for! 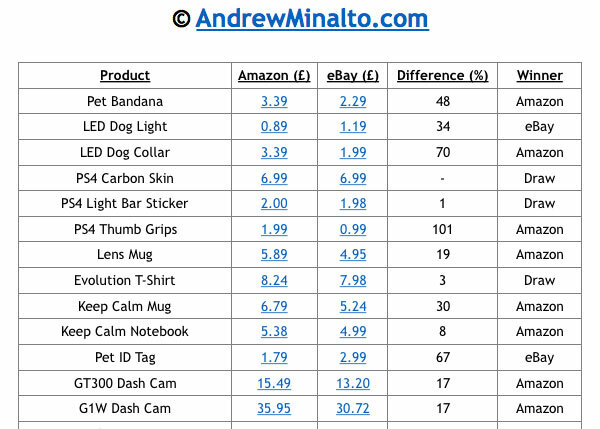 I’ve compiled the results of the test, in which I compared the pricing of 50 different products on eBay and Amazon, into a PDF which you can download here. Product – a simple description of the product tested. Amazon – the price for that product on Amazon. eBay – the price for that product on eBay. Difference – the difference in price, as a percentage, between the two competitors. I put all of this into a separate document so that you can easily download and look over the results, rather than squinting at a small table on this page. Click on the image below to preview PDF in new window. Amazon in our winner – giving the higher price 26 times out of 50.
eBay won 17 times and it was a draw on 7 occasions (I decided that a 5% difference either way was too small an amount to declare a winner). So what do these results tell us? Should you abandon eBay and start selling on Amazon right away in order to benefit from these higher prices? NO! Although this test did pan out as I expected, with Amazon offering slightly higher prices on the whole – that doesn’t tell the whole story! First of all, and most importantly – a much larger percentage of the products on Amazon were BRANDED, i.e. a company had put their name on to the product and packaging to add value and differentiate it from the hundreds of similar options out there. I have talked about this so many times on my blog as it’s really an amazingly effective way to increase your selling price and profit, with only a minor increase in cost. Also, as is nearly always the case when you look at things logically, the eBay vs Amazon argument really does depend on your specific niche and product selection. For example, we can see from the test that for electronic cigarette items, eBay seemed to be a lot more expensive than Amazon, so blanket advice like “Amazon gets higher prices” wouldn’t apply if you were looking to start a business in that market. (this could be a bad example though as “technically” eBay has banned sales of e-cigs. Still, there are thousands of live listings on eBay for these products). And really that brings me nicely to my final conclusion – while these results are interesting and do give us some valuable insight into the two major selling platforms – it was only based on 50 products so we cannot place a huge amount of emphasis on the final result and you should ALWAYS do your own research before entering any niche. Nowadays we have access to so much data online, which means you can really find out everything you need to know before choosing which platform to start on. Simply replicate the test I’ve done today, but specifically for your own niche! That in itself will help you a lot in making a decision. Also, don’t forget that price is only one factor to consider (though of course it’s a very important one!). There are many other aspects you have to think about when choosing which platform to sell on, which I’ve covered in depth in this previous blog post: eBay, Amazon, or an Online Shop? Well that just about brings us to the end of today’s blog post. I hope you found it interesting and valuable! These “battles” seem to be quite popular with a lot of you, so if you have any suggestions for who else we can pit against each other, then please post them below in the comments section. As always, if you have any questions then I’m here to help as well. Here’s one for your battles – currency conversion companies/brokers/banks etc. Or, just an article on transferwire.com – I’ve been using a broker for a while and that’s a good option for larger amounts, but I’ve been sending a lot of small amounts in EUR from £250 – £1000, and the broker doesn’t work well as there is a set £10 fee. Transferwise.com was new to me, and definitely will be using in future. Fee from £2, and you get the mid-rate instead of 1 or 2 points under. Have to live with 1 business day speed instead of same day, but that’s okay! Thanks for your suggestion Paul! Will probably do a more detailed guide soon! 1. £50K on Amazon FBA in 3 MONTHS! 2. £14,065.86 February 2019 Update! 3. VAT for Amazon Sellers – from A TO Z! 4. £12K On Amazon UK in FIRST 30 Days! 5. Seasonal Amazon Product DISASTER! 6. 15 RULES to SUCCEED on Amazon! 7. DO NOT Buy Amazon Seller TOOLS! 8. Save 50% on Sponsored Ads COST! 9. Simple TRICK to increase sales by 30%! Amazon.de Germany’s VAT TAX Certificate/Declaration issue FINALLY SOLVED! How to START a Successful Amazon FBA Business in the UK! My £14,065.86 February 2019 Amazon FBA Update + Dynamic BIDS! My £17,284.28 January 2019 Amazon FBA Update! I don’t care about losses. I just don’t.